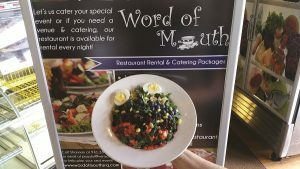 I chose my favorite salad from my menu at Word Of Mouth. The “superfood” salad is my favorite. I try to eat healthy, but at the same time, have been lifting heavy in the gym for years, and usually feel like a bear coming out of hibernation after a gym session. This salad has everything I need. The vegetable benefits of this salad are obvious, but I also like the antioxidant properties of the ingredients as well. We serve this salad with a pomegranate dressing, but I like it better with our house made Balsamic vinaigrette. It also comes with a choice of fresh baked muffin, scone, croissant, or artisan bread. It has a high amount of “good” fats in it from the egg and guacamole. I need to eat as many “good” calories as I can, so I also tend to add a grilled chicken breast to it. There’s not much to fix about this salad. If I was looking for a strict clean food option, I might leave out the guacamole, the chicken, and possibly the egg. I would certainly trade the muffin for the rustic 9 grain artisan bread, which is also gluten free.